Arabic Translation Software and Arabic Language Study Aids. LingvoSoft Flash Cards bring you fun and exciting games where you easily learn new words and reach perfection in spelling. Free trials download. Dictionary software applications give you advanced linguistic solutions. We use the text-to-speech and speech recognition technologies to make our software fully suit your purposes. 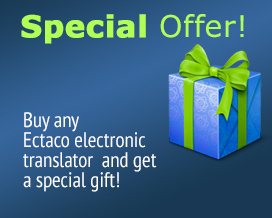 Add this ECTACO Online Dictionary to your Favorites! So that our letters do not end up in your spam folder please create a filter for the Ectaco.co.uk domain (or add us to your whitelist). You are a very welcome visitor here, at	English - Arabic Online Dictionary! Please have a try using our extensive language databases. We have designed these pages so that you can easily get instant back translations, for more complete understanding. You provide the words - we do the translating! The power of having online dictionaries at your fingertips feels good, so enjoy the experience! Sorry! Complete Arabic translation is accessible only with the full version of our software, which may be purchased and downloaded here . © Copyright 1990-2013 ECTACO, Inc. All rights reserved.